As one of the 2016-2018 TMA James T. Lubin Fellows, I am committed to improving the lives of those affected by transverse myelitis and related conditions. My interest in this field developed while caring for children with transverse myelitis, acute disseminated encephalomyelitis (ADEM), and acute flaccid myelitis during my pediatric neurology residency. I was struck by how quickly and dramatically a dysfunctional immune system could impact a child’s ability to see, move, and think. Following these children as they presented to the hospital helped me appreciate the value of early diagnosis and treatment. Children who received immune-modulating therapies earlier seemed to do better on the whole. Therefore, one of my major goals is to better educate the medical community to recognize these disorders and this is why I am so grateful that the TMA is increasing awareness about rare neuro-immune conditions with this campaign. Through working with the TMA, I’ve had the pleasure to meet many individuals with transverse myelitis and other rare neuro-immune disorders. While I was in Michigan, I met Rebecca Whitney, the Pediatric Program Manager at TMA and together we worked to set up the Michigan Support Group. It was so rewarding to see people with TM, NMOSD, ADEM, AFM come together to share their perspectives and help others at different stages of the condition. The support group also informed me of what people truly care about and highlighted the current gaps in clinical care. I would strongly encourage members to seek out or create a local support group; it can make this whole experience a lot less alienating. Attending the TMA Family Camp this summer was an unforgettable experience. I loved meeting the people at the core of TMA and the community of children and families who have been affected by this condition. I was amazed by the instant connections that families formed over shared past experiences. The educational programs tackled a fascinating range of topics from intensive rehabilitative technologies, to the vast array of adaptive sports, to the promise of new therapies that could someday facilitate neuronal repair. The best part, of course, was seeing how happy the children were. 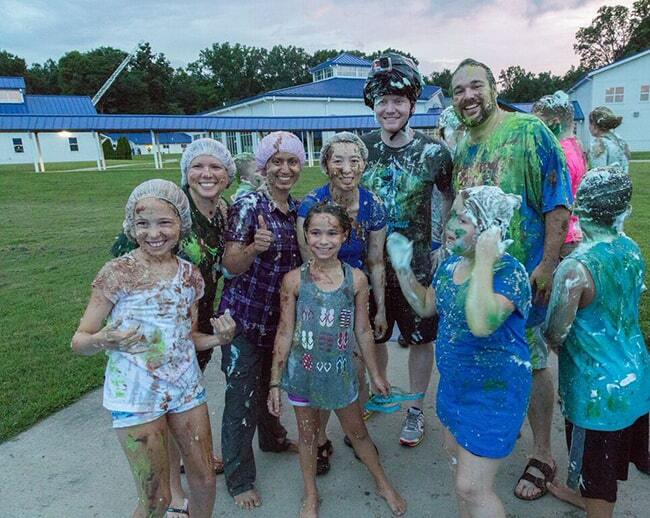 From swimming to horseback riding to the notorious Messy Games, the camp allowed everyone to indulge in their inner child and have some fun. I am now a fellow working with Dr. Greenberg and his incredible team at UT Southwestern. I have seen how a comprehensive, multidisciplinary clinic can improve care for those with TM, NMOSD, ADEM and also how these strategies can be implemented successfully away from a large, academic center. In the coming months, I will be developing a research project examining acute disseminated encephalomyelitis (ADEM) and its outcomes. I hope people in the TMA community will consider participating and that this study will improve our understanding of autoimmune disorders of the brain and spinal cord. I am so thankful to become a member of the TMA community and believe that hope combined with action will allow us to create a brighter future for our loved ones.